This week thru 3/23, ShopRite has Colgate Optic White Mouthwash 16.9 oz priced at only $2.49 each when you buy 4. 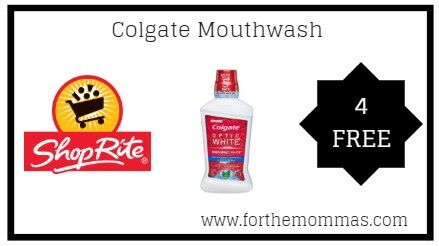 In addition to this, we have a $2/1 Colgate Mouthwash printable coupon and a ShopRite digital coupon to use on this deal to make your final price FREE! !